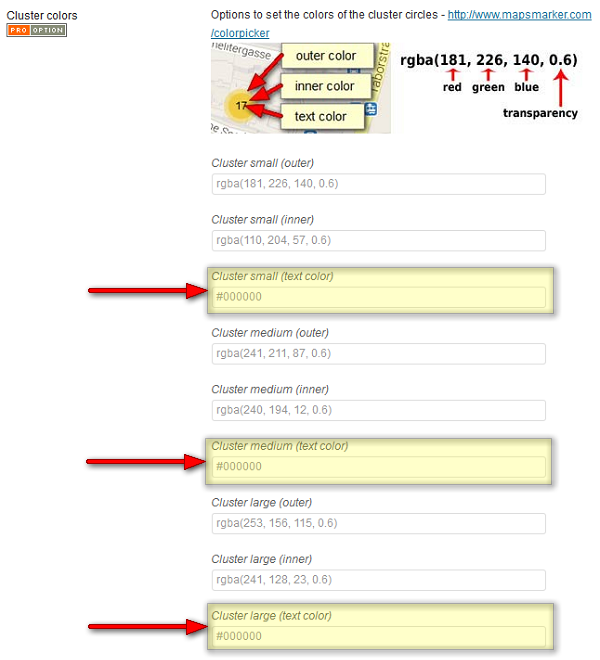 Although v1.3.1 is an important bugfix release, it also adds a new option to change for clustering text colors. Please see below for more details. Thanks Simon for pointing this out – when adding the options to the default cluster circle colors in pro v1.3 I didnt think about the text colors within the circles. As you can limit the number of markers which should be displayed in the list of markers below layer maps and as this was used to parse any shortcodes in a hidden div below each marker entry, this could result in breaking layer maps if the marker was not listed in the list of markers. I did look for a solution to also make parsing of shortcodes possible in layer maps possible, but then decided to drop this feature as it has more disadvantages, like bloating up code and html output unnecessarily, especially on layer maps with hundreds or even thousands of markers. With pro v1.3 I added a fix to display the special characters &, < and > correctly when hovering an icon on a map (and not display them as &amp; &lt; or &gt; as before). Unfortunately this fix had the side effect that if other special chars were used in the marker name, that layer maps could be broken. v1.3.1 solves this issue now.